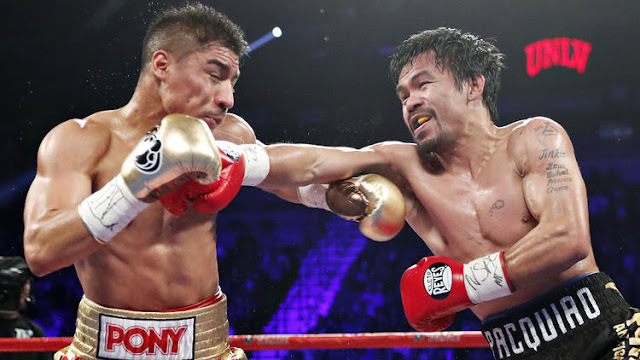 Senator Manny "Pacman" Pacquiao is the NEW WBO world welterweight champion after beating the much taller and much younger Jessie Vargas today November 6, 2016, PHT. The 38 years old from Saranggani Philippines totally won decisively. Pacman wins nearly every round and he is the aggressor in the fight. He knocks down Jessie Vargas in round 2 and after that Vargas became hesitant to throw punches. The younger American boxer does not display his usual boxing style and he is backpedaling all the time in the fight. The Filipino Senator win the WBO world welterweight title with the score of 113-114, 109-118, 109-118 all for Pacquiao. Meanwhile, top young prospect Jessie Magdaleno take the WBO jr featherweight title with the Filipino Flash Nonito Donaire via Unanimous Decision 112-116, 112-116, 110,118. It was an exciting bout and both fighters showed their ruthless punches but nonetheless no one goes down. Nonito Donaire loses the fight and dropped his record to 37W(24KO)-4L while the Mexican American Jessie Magdaleno improved his undefeated record to 24W(18KO)-0L.